While I’m not the most adventurous foodie out there (the list of foods I don’t eat is probably twice as long as the foods I do,) I’ve found that growing up in a partly Chinese household has made me open to trying other types of Asian foods. While there is no way I will ever, ever eat pig’s ear (which my mom declares with certainty is delicious and loaded with calcium) I will venture into other foods. One type of food I’ve found myself enjoying immensely is Thai food. 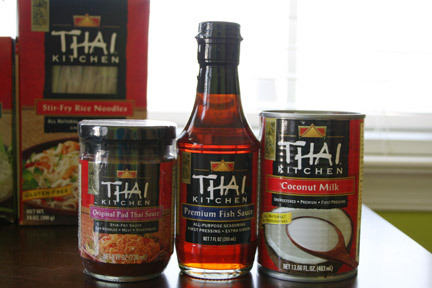 There are a few great Thai restaurants in the area but I had yet to have the courage to try to cook my own Thai food until I received a collection of products from Thai Kitchen. The challenge with pre-made sauces and pastes is authenticity. There are plenty of General Tso’s chicken sauces on the shelves – but did you know that General Tso’s chicken isn’t even an actual Chinese dish? The challenge for Thai Kitchen is to make sure that their products taste exactly how they would if I ate real Thai food. As a frequent eater at Bangkok Garden in Bethesda, I think I have some idea of what authentic Thai food tastes like, and that was the standard I held Thai Kitchen to when I prepared their Pad Thai and Green Curry Beef. The two dishes I made used several of the Thai Kitchen products, including the Stir-Fry Rice Noodles, Coconut Milk, and Original Pad Thai Sauce. The Original Pad Thai Sauce had a distinct sweet and sour taste and smell to it. I was worried that the flavor of the sauce would overwhelm the dish and make it too flavorful, but I didn’t have to worry. I followed the recipe (except for the peanuts, which I forgot to buy) and ended up with a very real looking plate of Pad Thai. If I hadn’t known that I’d just spent the previous 20 minutes preparing and cooking this dish, I think it could have passed for authentic Thai food. The flavors were spot on and the dish was surprisingly savory. The strong flavor of the pad thai sauce seemed to get soaked up and balanced out by the rice noodles and the bean sprouts. I had a similarly positive experience when I prepared the Green Curry Beef – the initial smells and tastes of the ingredients make you think “Woah, am I going to like this?” and then after the dish is cooked and you take your first bite you think, “Wow, this tastes GOOD!” I was admittedly thrown off by the green color of the Green Curry Beef but was quickly won over by the first bite which was creamy and smooth (from the coconut milk) and encapsulated so many different flavors that it was just delicious. Cooking with Thai Kitchen products and following the Thai Kitchen recipes really made me realize that Thai food was a lot easier to prepare than I had thought. It’s all about starting the dish with high quality, fresh ingredients, and authentic flavors – both of which Thai Kitchen provides. We couldn’t seriously call ourselves Thai Kitchen if we weren’t committed to making nothing but the most authentic Thai food. There’s no faking it. We’re about providing the best Thai food experience available to anyone, anytime, without compromising quality for convenience. That’s why we use only fresh, natural ingredients selected at harvest for their quality and flavor. With Thai Kitchen, you can say goodbye to Thai food delivery and pricey restaurant meals. 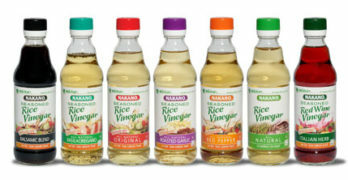 Our broad line of more than 60 products is available in supermarkets nationwide and, coupled with our easy-to-follow recipes, makes preparing delicious, authentic Thai dishes a snap! One winner will receive a Thai Kitchen Cooking kit filled with some of Thai Kitchen’s staple ingredients (which may include Coconut Milk, Premium Fish Sauce, Red Curry Paste, and Jasmine Rice) plus a Thai Kitchen cookbook. Visit www.thaikitchen.com and tell me in the comments below which Thai Kitchen product you would like to cook with the most or which recipe you want to prepare. Giveaway ends at 11:59 PM EST, September 30, 2010. Disclaimer: This post consists of my (and/or fellow tester) opinions only. No compensation was given for this review/giveaway. I did receive free samples of Thai Kitchen products from the manufacturer or representing PR agency to use and test for the purposes of this review. This did not affect the outcome of this review. 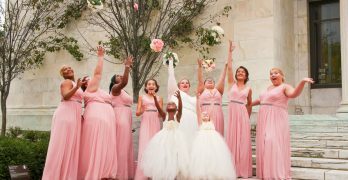 Too many to choose just one. Pad Thai jumps to mind, looks smells and tastes delicious. Green Curry Chicken with basil is also a fav at our house. I would love to try Bangkok Curry Instant Rice Noodle Soup. Sounds good! I use their fish sauce and their coconut milk alot, it makes excellent curries. I would like to try their roasted red chili paste, I haven’t used that yet. I’d like to try the coconut milk – I’m getting close to experimenting with thai cooking. I’d like to make the Traditional Pad Thai Noodles. I just voted for you on We’re on the Fence. I do love your blog. I’d like to use the coconut milk to make Green Curry Chicken w/basil. It looks delicious. I would love to make the Chicken Satay. Thanks. 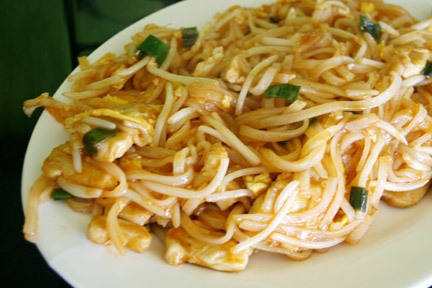 I want to try making the Traditional Pad Thai Noodles . I’d love to try the chicken satay. I would cook with the rice noodles…they make awesome dishes!!! Red Curry Shrimp and Vegetables sounds adventurous. I would love to try the Chicken Satay recipe. Sounds yummy. I’d like to try the Red Curry Shrimp and the Thai Iced Tea. The traditional pad thai looks very good, especially with those fat shrimp nesting on top! I would like to try Green Curry Chicken with Basil. It sounds yummy. I use their products already but I’m still entering! Their coconut milk is a staple in my kitchen….never bought their fish sauce though, so I’d like to try that.. I would love to try the Chu Chee Shrimp. I would love the Banana Coconut Smoothie. I’d make the Thai Beef and Peanut Stirfry…what I love about this giveaway is that it includes so many ingredients that I’m too lazy to buy and therefore never make the dishes they call for! I make soups a lot. I would like to try making the Coconut Ginger soup. Mmmm. Green Curry Chicken with Basil. I’d love to try that. I would love to try the chicken with chile and basil – yum!!! The Coconut Chicken recipe sounds delicious! I would make the Red Curry Glazed Roast Pork recipe. I would like to try their coconut milk in the making of a coconut curry. Yellow curry? I’d like to make the easy Chicken Pad Thai! I love Pad Thai and have always been intimidated by the complex flavors and unusual ingredients! I would love to make the Bangkok Shrimp Cocktail. Thanks. I’d like to try the Thai Kitchen coconut milk to make curried chicken. The green curry sounds intriguing, as well. I would like to try a new Thai recipe and use the “Stir-Fry Rice Noodles”, Yum! I would love to try the Green Curry Chicken with Basil Recipe. I would love to try their red curry paste. I love curry, but I’ve never tried cooking it at home. I would like to make Thai Caesar Salad. I’d like to try the Stir-Fried Rice Noodles with Chicken and Basil…I grew some Thai basil in the garden and this recipe would make good use of it. I haven’t tried rice noodles yet and always wanted to, thanks. id LOVE to try making the sweet pork fried rice! yum! I would like to try the Chicken Satay. I would most like to use the coconut milk in green curry chicken. Thanks for the chance. Subscriber to the WiC Project via reader. Thanks. I would like to try the Roasted Red Chili paste. It would be perfect for seasoning veggie and tofu curry, and it would also be great for making a dipping sauce for spring rolls and dumplings. I would love to try the Coconut Corn Pudding made with the Coconut Milk. I love dishes made with coconut milk. Thanks. The Traditional Pad Thai Noodles would be my choice! I like the chicken satay. I really enjoy Pad Thai; who knew that fish sauce was an ingredient.